I am including his many recipes and hope you enjoy them as much as we do. TO SID... CHEERS OLD BUDDY... WE LOVE YOU DEARLY FOREVER !!! _This is Sid's rib recipe – it is the best, trust me!!! For best results, DO NOT omit anything. 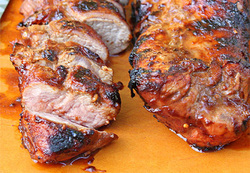 The first sauce is a marinade in which the ribs "sop". The "mop" sauce is a traditional tomato-based one, the kind we typically think of when barbecue sauce is mentioned. The Mop Sauce is also delicious on beef or chicken. Combine the above ingredients except for the ribs in a large Zip Lock (60 x 40 cm) big enough to hold all the meat. Taste the sop sauce for seasonings and adjust accordingly. 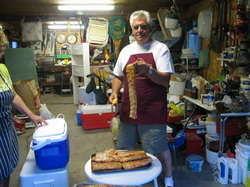 Add the ribs to the marinade and turn them so that they are evenly coated. Let them marinate in the refrigerator for 6 to 8 hours. Bring the meat to room temperature before cooking it. _Prepare a charcoal grill and allow the coals to become very hot. Cook the ribs, basting them with some of the remaining marinade. **Do not baste with the MOP sauce (below) until 5 minutes prior to the end of the cooking. 5 minutes each side on direct heat, and 30 to 45 min. on indirect heat. Serve this sauce with the Texas-style ribs or with any barbecued meat. Heat oil in small saucepan over medium heat. Add the onion and sauté until it becomes golden and translucent – approximately 5 minutes. Add the following ingredients and bring sauce to a boil. Lower heat and simmer 5 to 7 minutes. Cool and bottle. Keeps for a week in the fridge. The Making of the Dough... Amateur as Sid would say... I don't think so...what do you think??? Could anyone get more flour on him than Sid??? NOT!!!!! Pizza is Ready... but Houston we have a Problem !!! Mix 3½ cups bread crumbs and 1 cup Parmigiano. 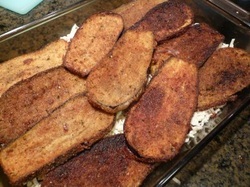 Coat eggplant slices in flour, dips in eggs, and then in bread crumbs. Fry eggplant in a pan with olive oil or butter for 4 min. until brown (turning half way). In pan, cook 4 garlic cloves in ½ cup oil for 4 min. Add tomatoes and cook on high 5 min. Add salt and pepper, reduce heat, and cook 30 min. Add basil and cook an additional 15 min. In baking pan, add 1 layer tomato sauce. Add eggplant, mozzarella, and sauce. Repeat for a total of 3 layers. Finish with tomato sauce and Parmigiano. To water, add coarse-grained salt. Top with 25 large sprigs Italian parsley – leaves only. Prepare the pepper pasta using the ingredients and quantities listed, placing the ground pepper in the flour well together with the eggs and salt. Following directions further below. If using fresh tomatoes, cut them into pieces. 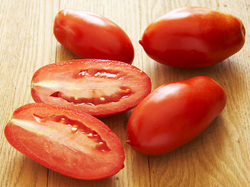 Place fresh or canned tomatoes, garlic, and oil in a med. sized pan, and cook over med. heat for 15 min. Taste for salt and pepper. Pass the contents of the pan through a food mill, using the disc with the smallest holes, into a medium-sized crockery or glass bowl. Return the strained tomatoes to the saucepan and reduce the sauce over low heat for 5 minutes. Bring a large pot of cold water to a boil. Add coarse salt to taste, add the pasta, and cook for 1 to 3 minutes depending on dryness. When the pasta is ready, drain and transfer it to a warmed serving dish, pour the sauce over the top, and sprinkle with the parsley. Place the flour in mound on a pasta board. Use a fork to make a well in the centre. Put the eggs, and other ingredients specified in the well. With a fork, first mix together the eggs and other ingredients. Begin to incorporate the four from the inner rim of the wall, always incorporating fresh flour from the lower part, pushing it under the dough that is forming to keep it from sticking to the board, Remove pieces of dough attached to the fork. Put the pieces of the dough together with your hands. Scrape the board with a pastry scraper, gathering together all the unincorporated flour as well as the pieces of dough coated with flour. Place this flour with the pieces of dough in a sifter. Resting the sifter on the board and using one hand, "clean" the board by moving the sifter back and forth. The globules of dough will remain in the screen and not filter through. Discard them because, being already coated with flour, they will not integrate into the wet dough and will cause lumps, which will make holes when the dough is stretched. Start kneading the dough using the palm of one hand and folding the dough over with the other hand, absorbing the leftover flour from the board. Do not sprinkle the flour over the dough. Continue kneading, for a bout 5 minutes, absorbing the flour until the dough is no longer wet and all but 4 or 5 tablespoons have been incorporated (the remaining flour will be used for a second kneading of the dough). If you intend to stretch the dough by machine, knead for only 2-3 minutes. The amount of flour left over will remain about the same. A ball of elastic and smooth dough should be the result of kneading the dough for this length of time. You can now do the additional kneading or stretching of the dough either by hand or with a pasta machine. Stretch the sheet to about 1/16 inch thick – on the pasta machine, take it to the next to last setting, and cut it into tagliatelle (Roll up the sheet and slice into 1/4" strips. Unroll the pasta to dry). 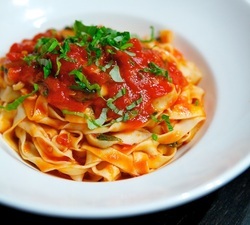 Let the tagliatelle rest on cotton towels until needed. Put oil in fry pan and add garlic. Cook until tender. Do not burn. Add tomatoes, salt & pepper, and chili peppers. Heat on medium (gentle boil) for 25 minutes. Remove from heat and put through food mill. Place back in pot and serve with pasta. Wash and pat dry chicken and cut into bite pieces. Using a large heave skillet with cover, add olive oil and garlic, and sauté until garlic is golden brown. Remove garlic. When oil is fairly hot, add chicken pieces and sauté until it's nicely browned, turning as needed. Add salt and pepper to taste. Cover and let simmer until tender (about 5 minutes). Add peppers and onions, and cook until tender and crisp, but not limp. Turn to med-high heat, add tomato paste and blend well. Then add tomatoes with their juices. Season to taste with pepper flakes. When tomatoes have cooked to a sauce consistency, add mushrooms and sprinkle with parsley. Toss mixture in pan to allow flavours to blend. Cover and let rest for 1/2 hour before serving. This sauce goes well with all macaroni-type pasta. Wash tomatoes in cold water. Cut them in half lengthwise. Cook in covered saucepan at a steady simmer for 10 min. Uncover, and simmer gently for 1 1/2 hour. Puree tomatoes through a food mill into a bowl. Discard seeds and skin. Rinse and dry saucepan. Put olive oil in, then add chopped onion and lightly sauté over med. heat until just translucent, not browned. Add carrots and celery and sauté for another minute. Add pureed tomatoes, salt, sugar, and cook on gentle simmer uncovered for 20 min. Stir occasionally. If using canned tomatoes: use 2 cups tomatoes with their juice, omit steps 1 and 2, and then simmer 45 min. 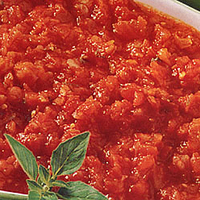 Although same as Tomato Sauce I (above), it has a fresher and more delicate flavour. The tomatoes are cooked less and the vegetables are cooked along with the tomatoes instead of undergoing a preliminary sautéing in oil. Wash tomatoes in cold water. Cut them in half lengthwise. Cook in covered saucepan over medium heat for 10 min. Add carrots, celery, onion, 2 tsp. salt, and sugar. Cook at a steady simmer, uncovered for 30min. Puree everything through food mill, return to pan, add olive oil, and simmer uncovered for 15 min. Taste and correct for salt. If using canned tomatoes: use 2 cups tomatoes with their juice. Start recipe at step 2, cooking the tomatoes with the veggies as desired. 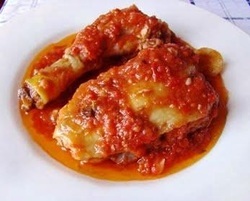 _This is the simplest and freshest of all tomato sauces. It has no veggies except for an onion, which is cooked together with the tomatoes. Except for salt and a tiny amount of sugar, the sauce has no seasonings or oil. Wash tomatoes in cold water. Cut them in half lengthwise. Cook in covered saucepan/pot until they have simmered for 10 min. Purée tomatoes through food mill and return to pan. Add butter, onion, 1 1/2 tsp salt, and sugar, and cook at a steady simmer uncovered for 45 min. Taste and correct for salt. Discard the onion. If using canned tomatoes: use 2 cups tomatoes with their juice and start recipe at step 2. This sauce is particularly good with stubby pasta such as maccheroncini, ziti or penne. Also excellent with spaghettini. Important: Do not substitute bacon for the pancetta. All ingredients of Tomato Sauce II above, up to and including pureeing the cooked tomatoes and veggies. Then proceed as follows. Make Tomato Sauce II, up to and including pureeing the cooked tomatoes and veggies. Transfer skillet content to a saucepan together tomatoes and simmer uncovered for 15 min. Obviously, this is made with spaghettini. Don't be put off by the amount of garlic. It simmers in the sauce so that its flavour comes through gently. A good canned Italian plum tomato (like San Marzano) is used. 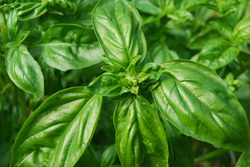 Rinse basil leaves and chop – about 1 1/2 to 2 cups. Put basil, tomatoes, garlic, olive oil, salt, and pepper in uncovered sauce pan and cook over med-high for 15 min. Cook spaghettini al dente, drain, and transfer to large bowl. Add sauce, mix thoroughly, and add a few drops of oil if desired. 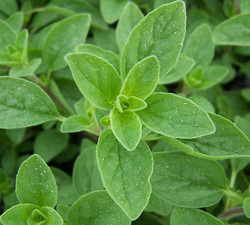 Fragrance of marjoram and cheese makes this a particularly dish sauce a delight for summer. Excellent with spaghetti. Bring tomato sauce to a simmer. Add marjoram and simmer 8-10 minutes. Remove from heat. Add both cheeses and oil to sauce. Once pasta is cooked and drained, return to pot. Pour sauce over and mix. Heat the oil in large skillet over medium heat. Cook and stir onion until soft. Crumble beef into onion mixture. Brown 6 min., stirring to separate meat, or until meat just loses its pink colour. Spoon off and discard fat. Stir carrot and celery into meat mixture; cook 2 min. over medium-high heat. Stir in wine; cook 4 to 6 min. or until wine has evaporated. Stir in milk and nutmeg; reduce heat to med. and cook 3 to 4 min. until milk has evaporated. Remove from heat. Press tomatoes and juice through sieve into meat mixture; discard seeds. Stir beef broth, tomato paste, salt, basil, thyme, pepper and bay leaf into tomato-meat mixture. Bring to a boil over med-high heat; reduce heat to low. Simmer, uncovered, 1 to 1 ½ hours until most of the liquid has evaporated and sauce thickens, stirring frequently. Remove and discard bay leaf. To serve, cook spaghetti in salted water 8 to 12 minutes, just until al dente; drain well. 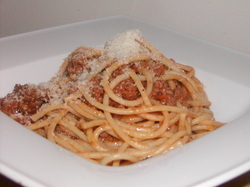 Combine hot spaghetti and meat sauce in serving bowl; toss lightly. Sprinkle with cheese. Rosemary, olive oil, garlic, orange peel strips, salt, and pepper in food processor. Blend until thick and almost smooth. Spread evenly over the meat. Refrigerate for up to 4 hours. 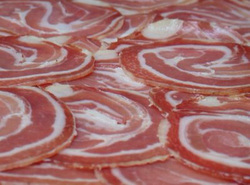 Remove from fridge and let stand for ½ hour before cooking the meat. Cook lamb/pork to 150F and let stand for 15 minutes before carving.